LABspace. 2642 Route 23 Hillsdale, NY 12529. ^On view through February 7, 2015. Expanding Mode. Concepto Hudson Gallery. July 19 – August 17, 2014. 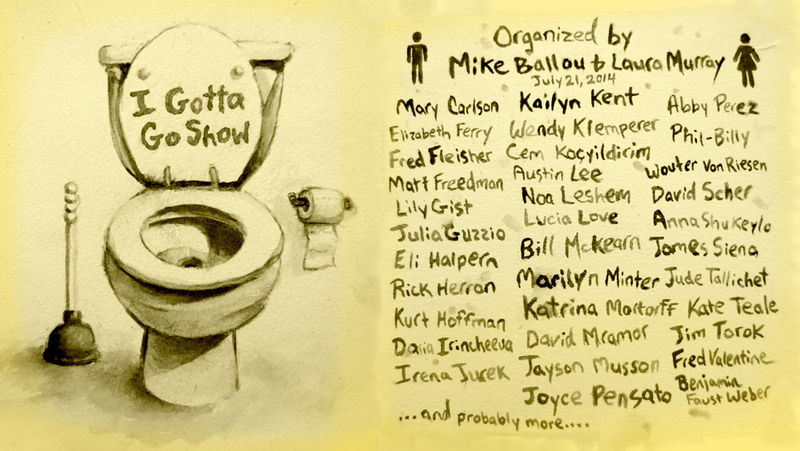 I Gotta Go Show. Mike’s bathroom. July 21, 2014. 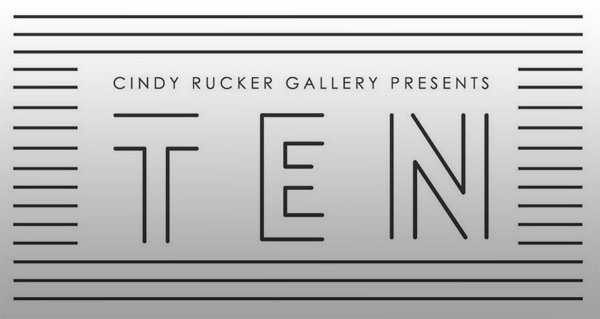 Cindy Rucker Gallery is pleased to announce a new art event, TEN, which will run May 9th through May 11th, 2014. This three-day salon style art event will feature curatorial submissions of ten diverse curators. TEN brings together one hundred artists in total, celebrating broad scope of the contemporary art world. 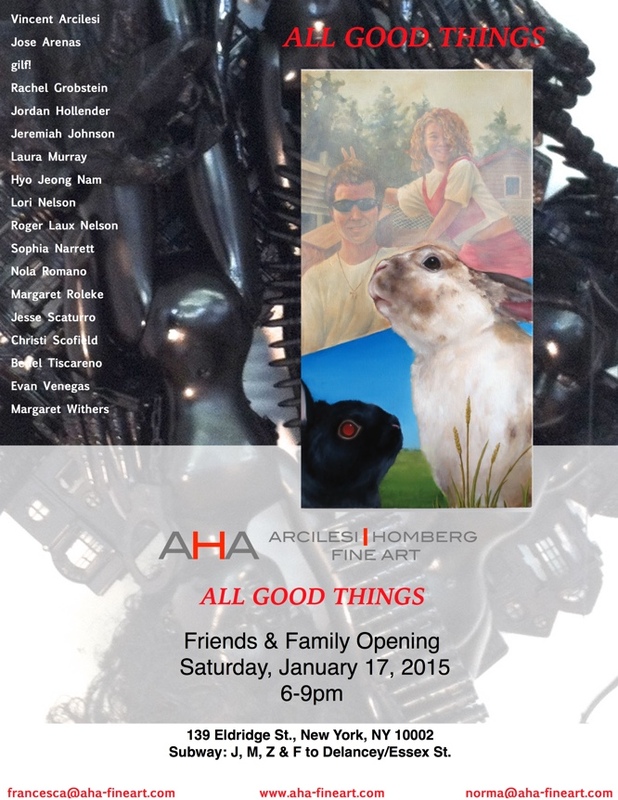 Opening Reception Thursday, December 12, 2013, 6:00-9:00 pm. They say great things come in small packages. As 440 Gallery presents its Ninth Annual Small Works Show this December, this adage may just prove true. The 80 pieces of artwork in the gallery, each piece no larger than 12″, represents a strong Brooklyn artistic presence, but also showcases artists from all over the country. The show includes a variety of media—painting, photography, sculpture—chosen by this year’s juror, Jessica Porter, art consultant and director of Porter Contemporary, a gallery in the Chelsea arts district of New York City. This much anticipated exhibition regularly opens with an overflow crowd spilling onto Sixth Avenue. There are three awards given each year: the Curators Award, the 440 Award, and the popular People’s Choice Award which is determined by the number of “likes” received by the works in the show posted on 440 Gallery’s Facebook page. Installed through the holiday season, the show attracts tourists, visitors in the neighborhood, as well as the many stalwart supporters of the local art scene. 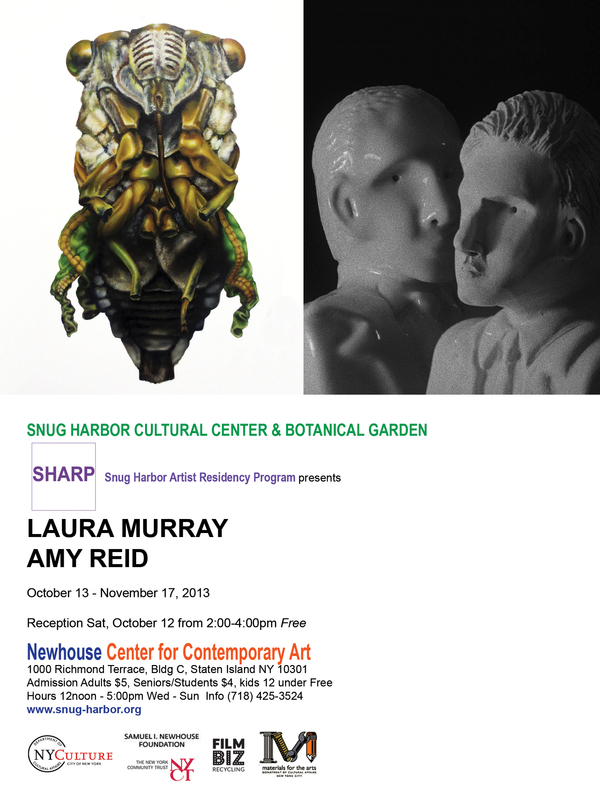 The show runs from December 12 through January 12, with an opening reception on Thursday, December 12, 6:00 – 9:00 pm. The eighty artists accepted into this year’s show are: Torey Akers, Diane Allison, Kiley Ames, Audrey Anastasi, Efrat Baler, Beatrice Bardin, Nicole Brauch, Zel Brook, Melitte Buchman, Lloyd Campbell, Arthur Celedonia, Jana Charl, Erin Cross, Corinna D’Schoto, Steve Davis, Andrea DeFelice, Christine Dengel, Phil DeSantis, Anthony DiMaggio, Monica Emmons, Brian Everett Miller, Michelle Farkouh, Chloë Feldman Emison, Benjamin Ferguson, Donna Festa, Jane Foley Ferraro, Gail Ghezzi, Peter Goldwater, Johanna Goodman, Carlo Grassini, Leslie Green Guilbault, K. Gretchen Greene, Susan Greenstein, Anna Haczkiewicz, Tighe Hanson, Eric Hartley, Micòl Hernández, AimeeHertog, Jen Hillman, Martha Ives, Dana James, Elizabeth Keithline, Richard Kessler, Bernice Sokol Kramer, LisaKurt, Susan La Mont, Kerry Lange, Matthew Langland, Garam Lee, Kristie Lee, Yu-Chun Ma, Tali Margolin, DavidMarion, Hildy Maze, Lee Meltzer, Steve Messenger, Kate Missett, Laura Murray, Michael Nelson, Raisa Nosova, Ronald Peters, Julia Ponzek, Barbara Rubensohn, Kathryn Shriver, Rebecca Simon, Frances Sniffen, Pamela Stein, Carlton Sturgill, Wonil Suh, Ilona Szekely, Lois Teicher, Yeachin Tsai, David Vega, Yuki White, Dale Williams, DivineWilliams, Meghan Willis, Sangeun Yu, Hope Zaccagni, Abby Zonies. 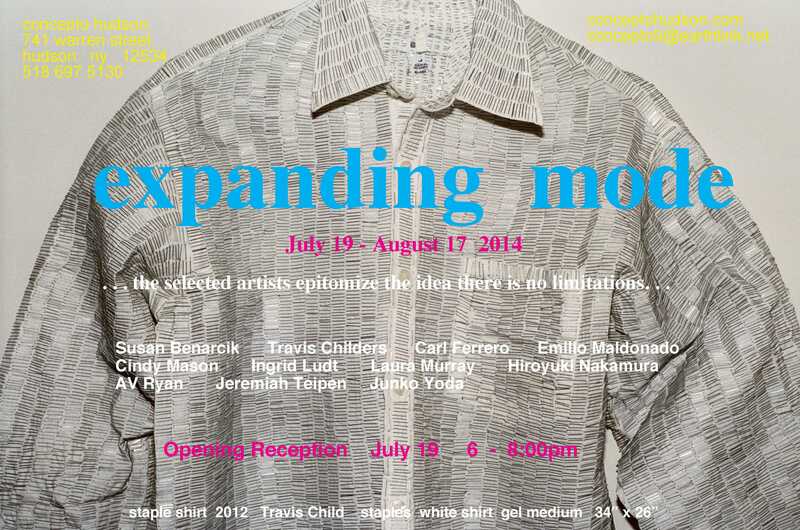 An exhibition featuring artworks by- Laura Murray, Scrapworm, Molly Dilworth, Unhee Park, Noe Kidder, Dylan Latimer, Eura Chun, Nicole Horton, Bianca Sanchez & More! No need to worry about what that spiritual mystic Beuys would think of us today. We can just revel in the florescent glow and thumping base lines of mass production. Family Business Will Show You How! Nine international artists come together for ten days to perform and inform, introducing one and all to the joys that their art products have to bring viewers like you. 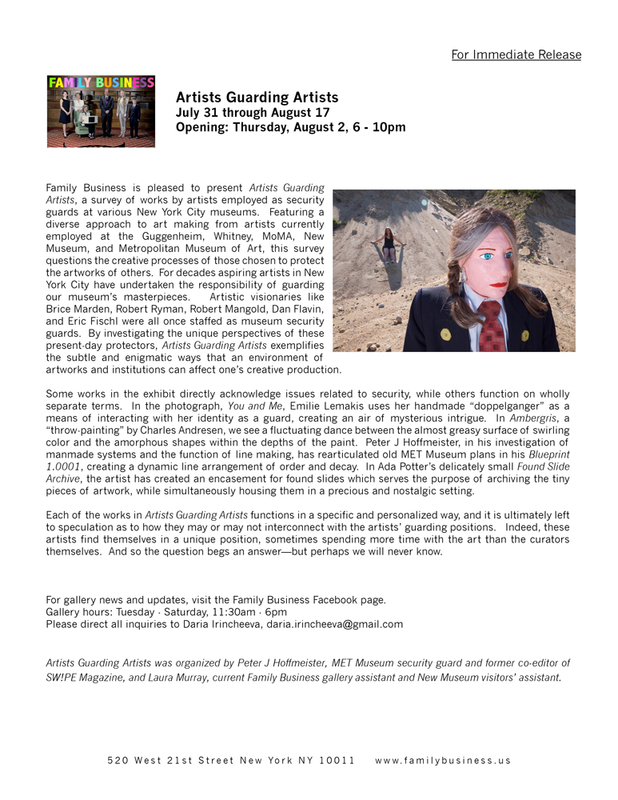 The gallery space will be set up as a fully functional green screen studio where performers will have the chance to workshop ideas centered around language to decipher, promote, and market visual arts. Difficult questions will be asked like, “Can you sell a painting like you’d sell a Sham Wow?” – “Does your Web presence influence your Chelsea presence?” – “Is romance dead? (or more importantly: “Does it sell as well as it used to?”)In addition to this if you ACT NOW!!! From the 24th – 28th will be an OPEN CALL for artists and performers in the Family Business community to bring a ready-made piece to the gallery and make a sales pitch for your art. Let us know about your work, show us all it’s special features, tells us if it slices, dices, and shows us what it is to be a human. We have the equipment to capture you on film, you just have to bring the wit, and sell baby, sell!!! The best performance will win a super special secret Fambiz Prize Pack, a featured spot in the online halls of fame, exhalation as a hero, and love for the rest of their days.A special thanks goes out to friends of The Family: Cluster Mag and B2Pro for helping to make this show possible! Shaking up the dusty model of art as an elite pastime, the Affordable Art Fair will showcase new artists, galleries, programming, and installations! Don’t miss a second!